Other Regulated Material ORM-C - 3" x 5" on Semi Gloss. 500 per roll. To bring you our best price minimum purchasing requirements may change without notice. Please call for the most up-to-date pricing on this item. 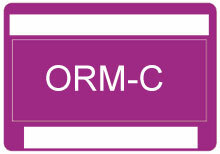 ORM-C shipping labels. The abbreviation for Other Regulated Material - Class C. An ORM-C material is one whose characteristics do not fit the ORM-A or ORM-B classification but nonetheless make it unsuitable for shipment unless properly identified and packaged. Uncleaned or used burlap bags are an example of ORM-C. The Other Regulated Material O33 is also known as ORM	O33	.